Less than two weeks after voting in favour of a People’s Progressive Party (PPP)-sponsored no-confidence motion, then government parliamentarian Charrandas Persaud stopped short of saying that he was now backing the country’s opposition party. 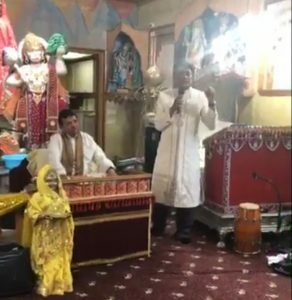 In an interaction with a pandit (a Hindu priest) before Hindu congregants in North America, he called on overseas-based PPP supporters to encourage their families and friends in Guyana not to vote for the Alliance For Change (AFC) of which he was a member or A Partnership for National Unity (APNU). “You are the ones that can make the difference as you have done in past elections. You need to call out your people over there, once you’re 18, get registered, check your name, go and vote. And you’re not voting AFC, you’re not voting APNU, I’m not saying more. You don’t want them back there,” he said. After Persaud took the vote and spoke with the media on December 21, 2018, he left Parliament Building through a back stairway and back gate in the company of two PPP supporters who were sitting behind him throughout the debate on the no-confidence motion. He was bundled into a waiting car that sped away and was trailed by another. He left for Canada the next day. Persaud, who is a Caribbean-trained lawyer, took credit for preventing the alleged provision of Guyanese birth certificates which could be used to obtain Guyanese National Identification cards as part of an alleged plot by the government to pad the voters’ list with foreign nationals. “This vote of no-confidence has stopped them or shortened their time for doing that by at least a year-and-a-half. Another year-and-a-half, they would have been able to put thousands of people on the voting list that would have supported them, so their rigging machinery has been seriously damaged by this vote of no-confidence,” he said in response to a question by the pandit about the chances of the next general elections being rigged. Persaud, who has denied that he was bribed to vote for the Bharrat Jagdeo-filed no-confidence motion and later went on to rhetorically question what was wrong if he had been paid, forecast a big win for the PPP. “If they hold a general election tomorrow, the PPP will take a 60 percent bare minimum,” he said. He said he was not interested in forming a political party because that could reduce the number of votes the PPP would win, but he had no qualms about splitting the AFC’s votes and support in Canada. “I will be taking votes from the PPP and that could create some problems that we don’t want,” he said. He is also wary of creating a minority government headed by APNU and “they will have a good time ensuring nothing moves them again”. Meanwhile, AFC Chairman and Minister of Public Security Khemraj Ramjattan said the police was “closing in” on information that Persaud accepted inducements for casting his vote with the PPP. Charran is not a hero, Charran is a villain and I am saying so based on the evidence we are getting,” he said. Persaud has since been expelled from the AFC and removed as a parliamentarian. His replacement is expected to be named and sworn in when parliament meets on January 3, 2019, Ramjattan said. According to Ramjattan, on that day, government is also expected to submit a legal opinion to House Speaker, Dr. Barton Scotland to nullify the vote on grounds of Persaud’s Canadian citizenship and a miscalculation of 33 votes instead of 34 as the majority. If not, Ramjattan said, government would take the matter to Court to settle the dispute.